Not everytime when you are on some other application, you would have to go to iTunes to pause or stop a song, or change the song being played. You can now control everything with a few keystrokes which you can specifically set for the iTunes software and you can use them when you are using some other application and don’t want to change the tab to go to iTunes to perform a certain action in it. The software or app is called SizzlingKeys which is available for Mac OS X to control iTunes without keeping its windows open. Control iTunes – Everything from pausing a song, stopping it, changing the song or playlist, searching songs from a big list, everything can be done with some keyboard shortcuts, and that too without having to go to the actual iTunes window. Don’t go to iTunes to check the currently playing song – You will just see a small popup window which appears anywhere you want, and not making you go to iTunes. This window would show the currently playing song with its song rating too. Its very easy to use and takes not much space and knowledge to get used to. And it’s free for download, although there is a paid version but most of the features are already there in the free version. 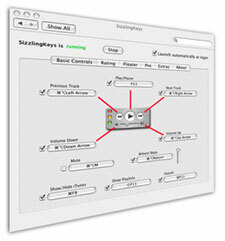 Download the SizzlingKeys software from here. WHy cant they make app like this for windows?? Chetan, can you let me know if they have one for windows?? hmm.. can’t use this>.< why only for mac?.. do they have one for windows?.. i need this so bad LOL..
why MAC OS? its so expensive here.